Combine the avocado, milk, cream, garlic, lime juice and salt in a blender or food processor and puree until smooth. 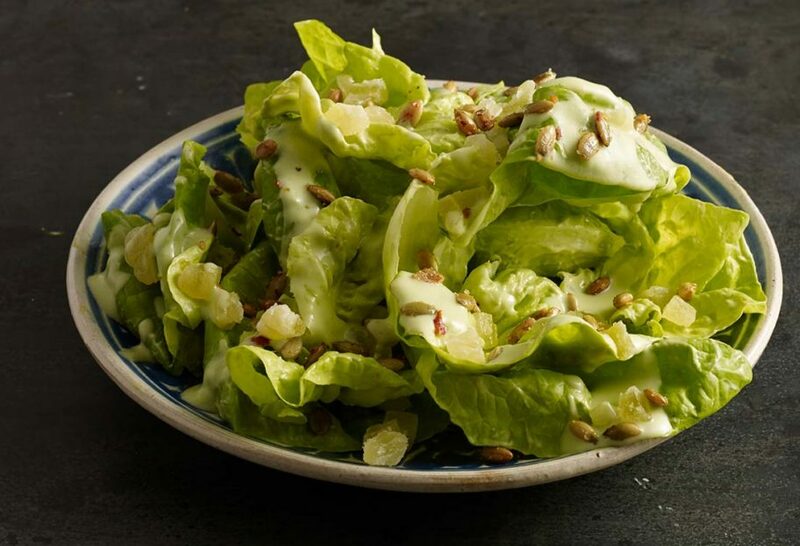 Place the lettuce in a generous-sized serving bowl, and toss with the dressing until the leaves are lightly coated. Sprinkle with the pineapple and pumpkin seeds and serve. Heat the oil in a saute pan over medium heat. Once it is hot but not smoking add the pumpkin seeds. Saute, stirring often, for about 4 to 5 minutes, they will have begun making popping sounds and some of them will begin gaining a nice tanned brown color. Transfer to a mixing bowl with a slotted spoon, leaving the remains of the oil behind in the pan. Sprinkle with the ground chile, salt and sugar and toss to coat. As they cool down, they will dry up and become crunchier. Eat or store covered with a lid. They will keep for about a week, if you don't finish them before then. Boston Lettuce Salad with Avocado Dressing–for this recipe, how long will the avocado dressing keep? Up to 2 days, well covered in your refrigerator. Stir or shake before using!